If you have a dog or cat problem, click on Fulton County Animal Services for the free county service. 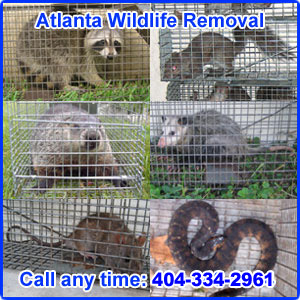 We operate a professional wildlife removal company based out of Marietta Georgia. We specialize in the resolution of conflicts between people and wildlife. Examples of common jobs that we do include the removal of squirrels in attics, complete rat removal and prevention, removal of bats from buildings, bird prevention, raccoon trapping, snake removal, and more. We remove dead animals from homes, repair wildlife damage, perform full home inspections, clean up wildlife waste and clean attics, and do 100% wildlife prevention work. If you have wildlife living in your building or attic, it's very important to find and seal all entry holes leading into homes in order to provide a permanent solution to wildlife problems. We service both residential and commercial projects. Give us a call any time at 404-334-2961 and we will listen to you describe your wildlife problem, and schedule an appointment to solve your animal problem. We are licensed and insured in the state of Georgia. We are owner-operated (we come to your home to do the job, not an underpaid careless employee) and are neat and clean with uniforms, service trucks, and the best wildlife trapping equipment. We have several years of experience, which is very important in ensuring a quality job done. We operate 24-7-365 for any wildlife situation. We give a written guarantee on our wildlife removal work and always strive for 100% customer satisfaction. 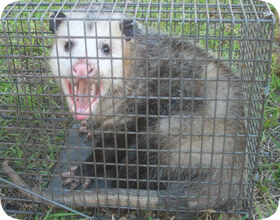 Wildlife Trapping: We specialize in humane wildlife trapping and removal. We remove all nuisance critter species in Marietta, including raccoons, squirrels, opossums, snakes, and skunks. We specialize in complete rodent control and offer 100% permanent removal of rats and mice. We also specialize in bat colony removal and bird and pigeon control. We use the proper wildlife control tactics and trap only the target wildlife, and when possible, we simply exclude the animals with no stress. Most importantly, we solve the root of the problem, and specialize in permanent solutions to wildlife problems. We do this by performing a detailed inspection of the home or building, and by sealing shut, with steel, any and all points of entry so that no wildlife can enter again, and we give a guarantee on our work! Hi, I would like to report the abuse and neglect of two cocker spaniel dogs. I am a neighbor and I am asking to stay anonymous to avoid problems. The dogs names are Benji and Bella. I have been over to talk to my neighbors and the place is a mess. I had never been in the home before until around spring of 2009, I always spoke to them at my house or out front. The problem is that they do not walk or let the dogs out to get exercise or use the restroom so there is feces, urine, and throw up on the carpet (from the dogs). I asked why they do not let the dogs in the backyard and I was told because there was no way to keep them in and that the porch was unsafe. I have offered to come by and walk them but they have refused my offer. When I asked why the dogs were throwing up they said they did not know. I told them they should take them in and have them checked. One of the worst things are Benji's nails. They have allowed his nails to grow out so far he now has a hard time walking. The nail has curved back to his paw and he whimpers as he walks. The daughter, Kristy, told me that they do not cut them because "It is hard to cut Benji's nails so we just leave it." I have seen them yell at the dogs for the mess 'they' cause and the dogs become frightened and huddle to the ground, when they grab the dog or just before when they come near they flinch and cower. I have not seen Benji or Bella get hit/punched but I have seen Kristy grab the dogs hard by the neck with her hand, push him around, and taunt him. I have even seen her come up and put a very small, short 2 ft. black leash on Benji and drag him around by the neck to which she continued while he coughs and chokes. I have heard yelps, her yelling yells, and what sounds like something being thrown and hitting the side of the dog but I have not not seen that action. Two of the adults that live there are mentally ill and they use a tide laundry can as a restroom in the garage/side room off of the kitchen and leave it out until they dump it once a week. I know Tracey recently has been struggling and dealing with the stress of Kristy not taking her medication properly which has been causing Kristy to act out in ways unsafe to herself and the people around her. I do not want to give out this family's personal problems and information but I do feel that this is partially the reason for Benji and Bella's poor treatment. I have offered to pay for the dogs to get their nails cut and to get the hair mats cut but they have always refused for one reason or another. Benji and Bella are adorable dogs but I am afraid are not being taken care of. I do not know if you want to go over there or just call.